Building on the author’s extensive experience in industry and government agencies, this book proposes a general framework for integrating the management of networked systems in the IP world. The Web-based Integrated Management Architecture (WIMA) leverages XML’s self-description capability to integrate SNMP data and CIM objects in a seamless manner. The first part of the book begins with a detailed analysis of SNMP; it highlights its strengths and weaknesses and justifies the need for object-oriented information models such as CIM. Next, the author summarizes the different paradigms considered in management research and industry in the past decade, compares the suitability of different middleware solutions, and concludes that with current technologies, Web-based management makes a lot of technical sense and is not just trendy. The second part goes into software engineering detail and discusses tradeoffs for organizing manager-to-agent communication. In WIMA, agents publish the monitoring data and notifications they can send, and management applications (managers) subscribe to them in a semi- or fully automated way. The same publish-subscribe paradigm is used for manager-to-manager communication, when managers are organized hierarchically to manage a large domain or different domains. We explain why this solution decreases network overhead and improves scalability. Security issues are also investigated. The third part of the book presents the high-level design of JAMAP, a research prototype that implements the main components of the WIMA architecture. Its code is freely available and released under the GPL license. This prototype is currently being ported to Web Services. Finally, the author compares WIMA with SNMP, WBEM/CIM and JMX and concludes that WBEM could evolve into WIMA in the future. This book is primarily aimed at software architects and engineers who design and write management applications. It should also be of interest to administrators and people who are versed into management architectures. 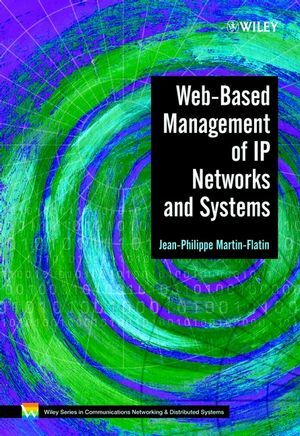 Jean-Philippe Martin-Flatin is the author of Web-Based Management of IP Networks and Systems, published by Wiley.